Mosaic Panel with Seated Dog, Byzantine, Syria, 5th/6th century, Art Institute of Chicago, Anonymous loan. 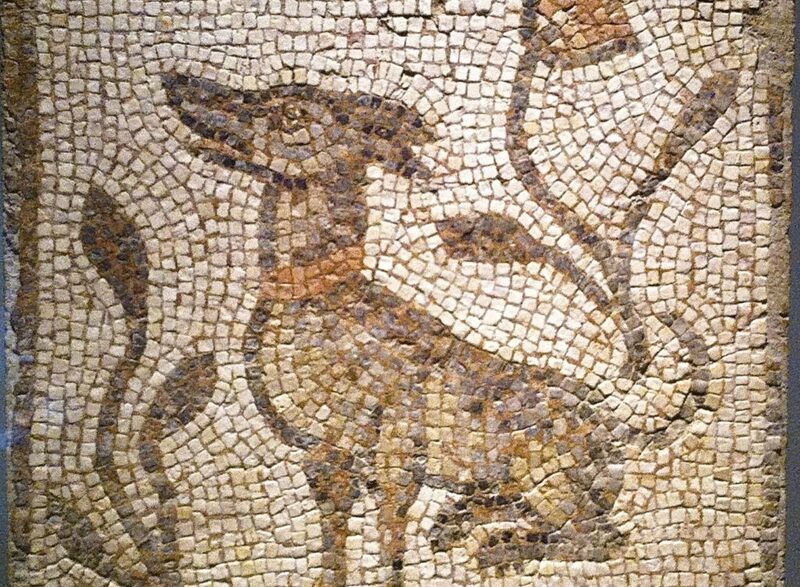 Dogs have been part of the archaeological record since ancient times. Now, thanks to the K-9 Artifact Finders Program, dogs will have the opportunity to play a role in protecting that record. It is commonplace to see trained dogs in tandem with law enforcement officers working to keep airports safe, find missing persons, or track down illicit substances. However, if this new and unprecedented program, run by researchers at Red Arch Cultural Heritage Law and Policy Research, in partnership with Penn Vet Working Dog Center, is successful, trained dogs will also be able to sniff out looted and illicitly traded artifacts. The K-9 Artifact Finder Program, emerged from research presented by the Red Arch Research team at the 2015 Culture Under Threat Conference in Cairo, Egypt. The team was looking for possible solutions for stopping the illicit trade of antiquities coming out of the Middle East and North Africa (MENA) Region, and it was clear that there needed to be a better way to stop these artifacts from crossing the American border. The K-9 Artifact Finders Program was their answer. The first phase of the program will be testing just that: seeing if the dogs are able to detect the antiquities. Phase two will consist of on-the-ground testing to see if the dogs can pinpoint artifacts from the MENA region outside of the lab. If the first two phases go well, then the third-and-final phase will consist of constructing a program to demonstrate the capacity of these dogs to customs officers, so that this program can be implemented on a national, and possibly international, level. It is important to note, that for the training, Penn Vet is protecting the artifacts by training the dogs to sniff out cotton balls that have been imprinted with their scents, rather than using the objects themselves. “If the research proves successful, then customs officers may have a new law enforcement partner to catch smugglers,” said St. Hilaire. The trained dogs would expedite cargo inspection processes by sniffing out suspicious containers, saving time for the officers who would otherwise be sifting through them. Once detected, the officers would then prompt an investigation into the possible illicit imports. This would speed up the process and allow officials to fully focus on cargo with suspicious contents, rather than having to unpack, inspect, and reseal hundreds of containers themselves. “I can think of several scenarios where an antiquities canine would greatly enhance the reach of a customs officer’s capabilities,” said Domenic DiGiovanni, a retired U.S. Customs and Border Protection Officer. From having these dogs at the port of entry or sea cargo facility, to having them in an airport where they can sniff luggage without disrupting passengers, DiGiovanni, who is also a consultant for the K-9 project, is convinced this program will have numerous advantages from a customs’ perspective. The K-9 Artifact Finders Program is an innovative route to take to attempt to stop traffickers in their tracks, and a feasible stretch for a well-trained dog. “Smugglers must be detected and arrested so that we can disrupt the illegal trade that is looting our history and culture and lining criminals’ pockets with illegal cash,” said St. Hilaire, and the K-9 Artifact Finders Program just might be a solution.